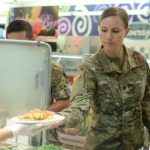 Do Airmen Really Need Meal Deductions? 11/20/2012 – SHAW AIR FORCE BASE, S.C. — Dorm-resident Airmen at Shaw AFB are not given the opportunity to decide whether they would like to have their base allowance for subsistence each month, but are instead automatically enrolled on a meal plan. Many Airmen have had, and continue to have frustrations with this automated process. “There are times where I don’t have time to get a lunch or sometimes dinner due to mission responsibilities,” explained Ryan DeLuca, Aviano Air Base, Italy. “Some may like the DFAC, but the DFAC here is not good at all. I’d much rather stock my fridge and pack my own lunch then go to the DFAC every day,” he concluded. “So you take away all Airmen’s BAS, yet you set them up in a dorm which typically has a kitchen in it,” said Airman 1st Class Amy English. These frustrations have been expressed before by Airmen who desired to have their BAS as opposed to meal deductions; however, Airmen often overlook the big picture as to why these funds have been, and are generally still, withheld from Airmen living in the dorms. The main reason first-term Airmen are placed on meal plans is to foster financial responsibility and ensure they have food to eat throughout the day. Aside from promoting fiscal responsibility in young Airmen, having the DFAC on base ultimately saves the Air Force money as opposed to paying out BAS to all Airmen. BAS and meal deductions are withheld and allotted based off appropriated funds by Congress from the annual budget projections of Air Force officials. At the wing level, the dining facility and finance office officials do not determine the deduction amount to be withheld from Airmen’s checks each month. They also never see, and are not directly involved in the collection or distribution of meal deduction funds. “In finance, we simply guide the money through the proper channels,” Brooks said. The dining facility serves an additional role in mission capabilities outside of convenience and affordability. “The DFAC is also used as a training platform that prepares Force Support Squadron personnel to conduct war-time operations,” Fricke added. Ultimately the dining facility is present to offer Airmen healthy, affordable and easily accessible dining options, bolster mission success and resiliency, and save the Air Force money while molding responsible Airmen.